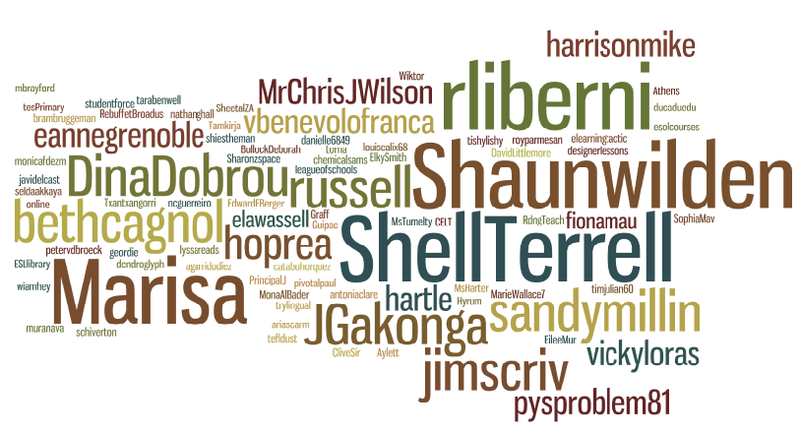 This is a summary of the #ELTchat that took place on Wednesday 18 April at 21:00 BST. It was a very rich discussion skilfully moderated by @Shaunwilden, @Marisa_C, @rliberni and @ShellTerrell. Observations for PD where the observer is the learner. Observations where the teacher is the learner and the observer is a coach / mentor / expert adviser. We also mentioned the “open door policy” and “Learning Walks” (or walk-ins). Is it good to have a culture of peer observation? Everybody agreed that it should be part of a school’s culture as it is great for building trust and seeing relevant ideas in your own context. If anything, it helps new teachers to identify different teaching styles and work towards their own. “It helped me immeasurably as a new teacher.” said @DinaDobrou. A culture of peer observation is valuable; it opens teachers up for reflective practice and also it reduces stress when formal observations have to be conducted. They become part of a routine and the experience of being observed becomes far less nerve racking. Most of chat attendees agreed that they learn a lot from observing their peers. You can also see something of yourself in other teachers. It is great to see what works and what could be done differently. Even time to reflect in a group setting can be beneficial for observation. @sandymillin claimed that observations are one of the best forms of CPD – most of the useful practical ideas she uses come from peer observations; but one needs to be reminded sometimes to go and watch other teachers. However it can be intimidating if teachers aren’t used to peer observations, but it is great when it is encouraged and ‘normal’. We need to wrap our minds around the fact that peer observations and constructive criticism are actually beneficial. Reflection and discussing with peers afterwards is another great part. How to introduce a peer observation culture in a school not used to that practice? The best way to get a change of a peer observation culture is to start it yourself. How about raising it at a staff meeting, volunteering to be observed? Also if another teacher shares the class, suggest watching each other. @ShellTerrell remembered that, one thing she really liked about taking her CELTA with @Marisa_C was that she was able to observe Marisa teaching first. Start by watching a videoed class together and saying what you would use then move on to challenging each teacher to observe someone else within a specific time period, then get together to share – by doing that you can introduce teachers to non-threatening ways of giving feedback. @Marisa_C suggested that perhaps it might be useful for school leaders to make this policy clear from day one – earn brownies by observing. This is more positive. Start asking for and offering ideas if this is not the norm. That can help to promote more openness. Have a week of cover for observing lessons. To introduce peer observations, you need to emphasise benefits for both parties and make it as informal as possible. @bethcagnol advised another sneaky way to get other teachers to observe your work – to mutually agree not to clean the whiteboard after class. How to minimise stress for to-be-observed teacher? @bethcagnol recommended that when observing teachers, perhaps one way to put them at ease is to say you look forward to learning something new. Also, why not invite the to-be-observed teacher to observe your class first? Give you feedback. Another way is to try to get the observer involved via being interviewed – a different person in the class, a new resource to use. Moreover, it helps break the awkwardness. There is a practice of starting with a video before moving onto personal visit to ease the student teachers in. Why not get the teacher to video themselves and then observe. This could then be moderated by the external observer. Recordings are good because they get you used to being observed and it becomes a routine for students as well. But for YLs and teens parental permission is needed! You can also use your learners and have THEM tell you how you did. Also, if you’re a DoS, teach a lesson sometimes that the teacher can grade. People are too used to graded observations – it casts a shadow over developmental peer observations. As Jim Scrivener (@jimscriv) pointed out, an observer saying “it’s purely developmental” then has to carry that through. It is essential to mentally separate Quality Control observations (on which jobs depend) from developmental help. Yet observers and the observed mix them. How to deal with teachers confusing these two and panicking? How to change the culture of professional development observations, so teachers wouldn’t ask straight away: did I pass? Solution: Development and performance management observations should be separate. Observation should never serve as a “gottcha” moment. Trainers fail to see that this is a true professional development moment. Developmental observations should have qualitative feedback not quantitative/graded – otherwise becomes just about grade. @louisealix68 observes her trainee teachers but their school mentor grades them. She only gives feedback and tips. We all agreed that it is the best practice to have established clear procedures how the observations are carried out. The crucial part of the procedure is to have a pre-observation meeting where the objectives and criteria of the observation are set, because it’s quite a common problem that many observers are not explicit about aims of the observation. It helps if those being observed know what aims or consequences of the observation are. It was agreed that it is very useful and task can come from previous observation comments – good thing for on-going development. Some of the chatters admitted that they like to ask student teachers what they want to have attention paid to, what is their personal goal. This also contributes to more direct and specific feedback. With peer observation, non-judgemental feedback should apply, no matter how experienced teachers are. Lots of chatters agreed with this statement. However… Is observation ever truly non-judgemental? Especially if it’s by someone in a position of authority (which is the norm) in which case it is better to assume it’s never 100% non-judgemental. But a good observer will know how far he should go on his judgement of the lesson – if necessary will limit feedback. We agreed that teachers need positive reinforcement and constructive feedback not patronizing. @ShellTerrell pointed that it is important that teachers feel they are being observed to be more effective and not made to feel like they’re bad teachers. Feedback is important. Some people like to discuss one or two areas for observation with teachers and stick to them! 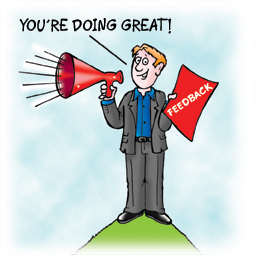 Giving feedback is an art – it involves deciding how much the teacher is “ready” to hear. Why do teachers generally don’t like being observed? Teachers’ fear of observation comes from potential consequences. Students don’t have as much power as peers/superiors, although they can ask to change class, complain about the teacher etc. True, but students may not be as critical as other teachers (colleagues) who might just see things different from the learners. This sort of situation was labelled by @Marisa_C “fear of a peer”. But she also added that TP students at her organisation have an uncanny ability to pick out teacher problems when CELTA or DELTA trainees ask them how they did. They can give very specific advice after they have been taught for a while. “Ask your students” can open up many possibilities. Also teacher appraisals (and competitive staffrooms) may cause teachers to fear peer observation – again a question of microclimate of an institution. Another opinion is that teachers don’t like to be observed because it feels like being checked. Most of people discussing were of the opinion that there are ways to change that attitude. – when the goals / purposes of the observation are set. A lot depends on who is doing the observing (and why) – if there is a power imbalance, then it can sometimes be intimidating. Problem with formal observations is that they aren’t always about teacher development; they can be just box-ticking. Teachers don’t like them perhaps because they feel they’re being tested instead of helped. @CliveSir brought up that at CELTA courses every TP is observed and assessed, and he doesn’t even notice the tutor in the classroom. Also he looks forward to feedback and learning. We all should be open to opinions and free to disregard them or learn from them. “This is all part of the learning progress so what changes after (CELTA)?” @rliberni asked. @Marisa_C” “All people are evaluated on the job – should teachers be an exception? Inner sanctum attitude? Teachers are good at doing that for students, but not as good with each other? @ShellTerrell admitted that she doesn’t believe in grading teachers as it becomes more about the score than specific feedback and goals to improve on. A grade may be “practical” but it’s unrealistic if we consider the complexity of the classroom interaction. This is why the very first thing we should do is set clear objectives for observation. “A school has a responsibility to students to decide if a teacher really isn’t very good. We can’t assume that everyone is good.” pointed out@jimscriv. Agreed, but how about using the observation more as something that informs and add to that other things. Such as checking how the teacher corrects and responds to written work, planning a lesson together and so on. Tutoring? Quality control can be done in so many different ways; school’s policies and so on. The observation is just part of that. It shouldn’t be the ‘make it or break it’ moment in a teacher’s career as long as there is willingness to learn. When you’re helping with PD, aren’t you somehow accounting for quality control? “So, it’s “demand high” teaching AND “demand high” school management. Biggest challenge is retraining managers.” @DinaDobrou replied. To support the argument that observation shouldn’t be the only tool to assess teachers @horpea pointed that even students behave differently in an observation. Some participants agree that however necessary and useful, it is a change from normal class dynamic – makes people uncomfortable. Others commented that it depends on routines; if students are used to being observed they may not act that differently. @hoprea repeated that for this reason observation should be a part of assessment process, but not the only tool. What else can be used? For instance, by discussing with the teacher their teaching and learning beliefs, you can have an idea of the lesson, and planning. “But why are we all so secretive, we are all doing teaching, right? If the school culture is one of non-evaluative feedback, why not? It’s a bit like the CCTV argument, if you aren’t doing anything ‘wrong’ then why should you mind?” asked @ed_russell and added that the best practice is for teachers to get a bit more public in their work, more open doors would lead to better observations. Lots of participants agreed that an open door policy is an excellent idea, but there need to be a few ground rules. A culture of open doors encourages reflective practice and sharing. How do we encourage it? In some schools there are glass doors anyway. Anyone can look inside but still observing a lesson from the classroom is much different. Why do teachers always close the classroom door? – It can disturb other classes (especially if the activities are loud or the teacher is loud). Most of the participants expressed their dislike to ‘Learning walks’ that were described at http://t.co/Et3nSBRs . “But an agreed school-wide policy of anyone can wander and drop-in for ALL is wonderful.” summed up @jimscriv. As a teacher who is being observed, should you be putting on your ‘best lesson’? It was generally agreed that teachers should present what they normally do otherwise the lesson is fake. What would be the point of that? What is more, preparing your “best lesson” implies that other lessons are not up to scratch – teachers should be consistent! But it was also acknowledged that for graded observations teachers do try to put on their “best lesson”… Some teachers admitted that it depends on the nature of the observation. If it is for professional development – there is no point over-preparing but for inspection (e.g. OFSTED)… well, that’s a different story. Do you have any guidelines/questions you use when peer observing? Or do you just watch? Or does it depend? “For informal I might just want to see how someone does something.” replied @rliberni. In Marisa’s organisation, they keep a bank of teacher observation sheets/checklists and teachers can choose which one to give observer. Another great thing for a school is for all the teachers to get together and create their own observation checklists for each other. In this way, the observed teacher is the one who makes the choice of the observation focus – picking an area of concern. You can work with observation sheets you have and ask teachers to change, adapt and add to them. @Shaunwilden said that when he was less experienced he used tasks provided by school. These days he just looks for what he likes and ideas he would steal. Do you believe checklists for observers are effective? If so, then what does a good one include? @hartle responded that it can be very useful. Both observer and teacher have it for a focus. Marisa informed us that most courses now, certainly CELTA and DELTA bring in the T’s action plan – quite important. Some of the chat participants were concerned that having a checklist may turn the observation into a “ticking boxes” process. Teacher observations should be customized and not standardized. Teachers, as students, need to get relevant feedback about their work. @MrChrisJWilson noted that often there is a problem to arrange peer observations due to the fact that most lessons are scheduled at the same time. But multiple perspectives are needed to see other teacher’s potential. Observation is ultimately a biased view of one person on someone else’s lesson. We need to ask ourselves WHO conducts observation. If it’s the school director who’s not even a teacher?! The director may be looking for other things such as discipline or rapport with the students. There are also cases of state schools where observer neither teacher nor English speaker! Most teachers are afraid of observers who are too wrapped up in their own wonderfulness! Hence harsh and judgemental. A good teacher doesn’t know that they are good. They are always looking for ways to improve their practice. No arrogance about themselves. Observers need to be competent! It’s important for observers to remember that what works for them might not work for the teacher being observed (and vice versa). SOME (not all) observation judgement can be subjective but be presented (and acted on as) as objective fact. What do you do when you first start observing officially? How do you manage the transition from peer to management observations? It’s important to see your job as supporting teachers. It’s much the same as being a teacher trainer, you look for the same things, good and bad. Another thing about observation is allowing the teacher some time to get better at improving after the feedback. How do we support that? Teachers having a reflective period after they are observed is also very effective and helpful. Harmer, Jeremy. The Practice of English Language Teaching. [London Etc. ]: Longman. Scrivener, Jim. Learning Teaching: The Essential Guide to English Language Teaching. [Oxford]: Macmillan Education, 2011. Ela Wassel is a CELTA qualified teacher and holds British Qualified Teacher Status. She has several years’ experience as a primary teacher in the UK and in teaching EFL/ESL in Polish state schools, as well as teaching adults. She has a Bachelor’s degree in English Philology and a Master’s degree in Political Science. At the moment she is a freelance EFL teacher and describes herself as passionate about her own professional development. I am a member of IATEFL and her blog is Ela’s ELT Blog – she is @elawassell on Twitter.